As well as the impressive ThinkPad business machines, Lenovo also manufactures the IdeaPad range. The U160 belongs to this series and offers good value, as long as your performance requirements are simple. Some of the more powerful laptops in this group test might prove to be overkill if your needs are limited, so while the Intel Celeron processor here isn't the latest model, it provides roughly double the performance of a netbook and will happily run most basic tasks with ease. The same can be said for the integrated graphics card. It provides basic graphical power and while suitable for consuming content, such as movies, won't provide the power for creating it, unlike the Asus U35JC-RX080V or Apple MacBook 13-inch. Despite the laptop's diminutive size – it is the smallest and, at 1.4kg, the lightest here – storage is excellent and the 320GB hard drive will provide plenty of space for your content. The laptop's battery life of 305 minutes is about average for the group, but with such a low-powered and resource-light processor, we expected more. However, you will have enough power for use on the daily commute. The solid plastic chassis and resilient lid provide plenty of protection for the laptop on the road. Like the Toshiba Portege R700-15x, the machine also features a sensor which recognises when the laptop has been dropped and takes measures to protect the hard drive – and your data – upon impact. 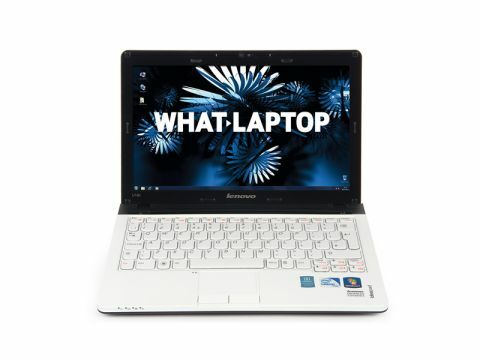 The 11.6-inch screen is quite small, but features the standard 1366 x 768-pixel resolution. Images are very sharp as a result, and we were just as comfortable working on this laptop as the larger 13.3-inch models. The keyboard spreads the width of the chassis, but is just as usable as the Apple or Sony Vaio VPCS139LE/B. A crisp action is provided and the keys are just the right width apart. One irritant worth mentioning is that that Lenovo has swapped the positions of the Ctrl and Function keys, with the latter now on the end of the row. This isn't exactly intuitive and took a while to get used to. There is no room for a dedicated numeric keypad. There are three USB ports for you to attach peripherals to, as well as both VGA and HDMI video out ports, and finally an eSATA interface – which transfers data to an external, compatible device at high speed – rounds out the specification.